As a tenant, you have a right to demand suitable living standards in your property. That means you have to be provided with a shelter from the weather and elements. The rented property needs to be wind and water free. Landlords are responsible for the repair and maintenance of your property’s structure and interior. This is defined in the Landlord and Tenant Act from 1985 and the Housing Act of 2004. In general, the landlord is always obliged to keep the exterior in repair. There are two common exceptions to the rule. If the tenant or their guests damage the exterior in any way, willingly or not, they are required to cover the costs of repair. If the tenancy contract exceeds seven years the rule is invalidated. Each items is regarded with the focus on conditions of life. If the damage is causing a risk for the tenant or their well being than it’s mandatory for the landlord to repair it. However, cosmetic and non-essential damages are up to the landlord’s discretion to repair. For example: If the rendering or stone cladding of the exterior wall is damaged, the landlord can choose to repair it or not. Since it’s only a cosmetic detail, it does not endanger the tenant in any way and there is no legal obligation for it’s maintenance. Landlords usually want to fix problems early, since it’s the most economical solution. However, their circumstances may prevent them from doing so. The law allows the landlord’s discretion for such improvements. It’s essential to the tenants and the entire property that the roof is completely water tights. A leaking roof can quickly bring ruin to the entire property. Leaks can result from many different problems. The roof tiles or other roofing materials must be property fit. Anything loose, broken or missing can result in water through the insulation. Obviously, leaking is the most visible indicator, but actual leaking results in very serious damage. More commonly, tenants can observe yellow to dark brown coloured patches on the ceiling, mould and stale air. 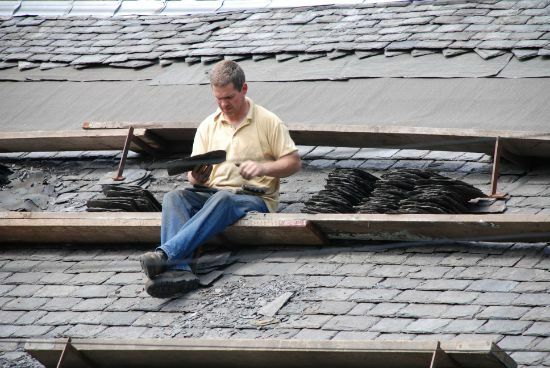 The roofing is the most manageable repair. Tenants must look for deformation of the shape of the roof. If any is present, then the supports and joists should be checked for problems. Previous water leaks might have weakened the wood or caused it to rot. Weak supports and joists should be fixed with higher priority in order to prevent a potential collapse. It’s both dangerous and extremely costly for the landlord to renovate. Caution is advised. The external walls must be well maintained to prevent water from going through. Usually, it takes time for the effects of water damage to show. Since the water has a long way to penetrate through the external wall and then build up in the space between it and the drywall. Black mould and coloration of the interior is a definite sign that water is coming through. The walls should be then thoroughly inspected for the problematic areas. Sometimes, it can be caused by other faulty parts like the roof, gutters, or even an internal plumbing problem. Any obvious damage like cracks and holes must be delegated quickly to the landlord. Cracked walls show signs of problems with the foundation or the soil underneath. Bad guttering and nearby trees can cause parts of the wall to subside and damage it’s integrity. This will also impact the joints between the given wall and the rest of the structure. If the developer did not property build the house, walls can bulge or bow with time. This effect is most visible by the doors and windows. Often irregular walls inflict pressure on the window or door frame and cause them to not close and open properly. If you see any signs of this, contact your landlord immediately. Another reason for a leaning wall can be a newly built extension. If the walls is not strong enough to support an expansion, it can start to deform over time. This usually doesn’t happen. Construction firms usually make thorough research if the structure can take the additional weight. If floor and ceiling joist have rotten, walls can come loose from the other structure. This can also cause leaning and bowing. Any problems with the foundation are likely to influence the walls as well. Structural problems are hard and expensive to repair. Make sure to inspect the property on a regular monthly basis and report all problems – big or small – to the landlord. One of the biggest factors for the heating bills is how weatherproof the property is. Indeed, leaking hot air outside the cold seasons can shoot your heating bill through the roof. Luckily for tenants, the law requires the landlord to proof the property from both wind and rain. All external windows and doors need to be damp and draught proof. Weatherproofing a window is fairly easy. Everybody can do it with some draught proof strips. They are very cheap and easy to apply. Pro-active tenants should implement them as a solution from the start. The money can be then requested by the landlord or deducted by the rent. If you DIY the problem, make absolutely sure to preserve the receipt for all materials or services that were needed to make the repair possible. Otherwise, you might be denied payment and have no way to prove your case. As a best practice advice, tenants should check about draughts in the viewing, or ask the landlord about it. For maximum comfort and savings on the energy bills, you should deal with this issue as fast as possible. However, acknowledge that this repair is not essential and can take some time to fix. The same would apply to the external doors. Make sure the window and door glass should be fixated well in the respective frame. Any movement of the glass will indicate that there are draught and damp problems. If the issues are severe, tenants might notice the room getting too cold, even if heating is turned on. Finally, and the most obvious (but also controversial) indicator is black mold along the sealant. It will tell you that moisture is somehow getting in between the window and the wall. This factor can be controversial. Bad heating and ventilation (caused by the tenant) will result in high condesation on the window. Thus, a similar black mould would appear on the along the window sealant. During heavy rains for a longer period of time, the gutters can save or break a property. Faulty, loose or blocked gutters can slush huge amounts of water along the exterior walls and can damage them severely over time. It takes considerably more money and effort to repair external and internal walls, than to repair a loose gutter. You must make average checks to your guttering from time to time. Try to take a look at the house during a rainy session. If you notice water running along the windows or walls, it’s time to check the gutters for issues. If you have a garden, you need to clarify with the landlord who is responsible for the garden maintenance. In many cases, landlords include garden maintenance as part of the tenants’ responsibilities. This can be perfectly legal, and tenants should respect that chore as if demanded by the law. If you do not wish to maintain the garden of your rented property, you must delegate it with the landlord. Only if the landlord agrees, you can be amended by that responsibility. Garden design, however, is something entirely different. If you want to change the design, layout or features of your garden, you will also need your landlord’s written permission. Garden design is treated the same as interior design and any alteration must be approved by the landlord. Otherwise, you might be forced to return the previous look of the garden. You might lose a lot of money, so always make sure you’re permitted to change the garden. Otherwise, the garden fence, post, the driveway and patio are also up to the landlord to repair. The garden fence and post might be the property of another landlord, or a joint property of your landlord and your neighbor’s. To find out who exactly owns the fence of either side of the property, you can purchase a plan from the Land Registry. If it belongs to the property of you neighbour’s landlord, you cannot hold your own responsible. That said, seek their assistance for easier communication with the actual owner. It’s the landlord’s job to provide you with a safe home and maintain an agreeable living standard in the property. This includes handling most of the vital repairs and improvements. However, this can only happen as a result from the tenant’s cooperation. Landlords don’t make inspections every day and it can take a while to find a flaw in their own property. Thus, tenants are responsible to monitor the property and report all problems to the landlord as they happen. At most it’s possible to annoy your landlord with frequent requests for minor repairs. However, it’s also in their best financial interest to fix issues as soon as they appear. Polite and effective communication between you and your landlord is vital to a positive rental experience. Should you have to move on and require a reference, the care you have demonstrated as a tenant will reflect in the reference your landlord gives you. If you have caused damage to the exterior of the building, you should take photos of the damage and send them in an email or letter to your landlord. Ensure the date is included in the letter and keep a copy for your own records. Let your landlord know that you will take the necessary steps to repair or replace what has been damaged. Ask if they have any preferred tradesmen or companies they would like you to work with. If you do not carry out these repairs or they are carried out to a poor standard you could face eviction and deductions from your deposit. If you find anything wrong with the exterior write a formal letter to the landlord and request for repairs. You will need to allow a ‘reasonable’ amount of time for the landlord to arrange an inspection and implement repairs. If you you feel that the landlord is taking more than a ‘reasonable’ amount of time to act, contact them again by all available means. Always include a formal letter, as it can be legitimately used as evidence in court. If you cannot get in touch with the landlord at all, you need to seek help from the Environmental Health Department at your Local Council. They have the authority to serve an improvement notice to your landlord. If they ignore the improvement notice as well, they will be punishable. For severe problems, the property can be taken out of circulation, as it’s unfit for human habitation to the standard required by law. If you’re unsure how to handle communication with your landlord, check out our related guides below. Get help with repairs, renovations and home improvements at a discount. Claim 10% off the price !